FACT CHECK: Did Sarah Huckabee Sanders Say She Was 'Proud' to be Compared to Aunt Lydia From 'The Handmaid's Tale'? Did Sarah Huckabee Sanders Say She Was ‘Proud’ to be Compared to Aunt Lydia From ‘The Handmaid’s Tale’? A parody Facebook account tricked some readers into believing that the White House Press Secretary had embraced an unflattering comparison made by comedian Michelle Wolf. On Facebook, White House Press Secretary Sarah Huckabee Sanders proudly embraced an unflattering comparison to Aunt Lydia from the Handmaid's Tale. Comedian Michelle Wolf’s monologue at the April 2018 White House Correspondents’ Dinner prompted widespread controversy, with some criticizing the nature of her jokes and others defending the routine. Wolf’s targeting of White House Press Secretary Sarah Huckabee Sanders drew particular scrutiny, with some commentators interpreting her remarks as an attack on Huckabee Sanders’s physical appearance. …And of course, we have Sarah Huckabee Sanders. We are graced with Sarah’s presence tonight. I have to say, I’m a little starstruck — I love you as Aunt Lydia in the Handmaid’s Tale. I don’t think I can fall asleep tonight until I say a few things publicly. First, I’m so grateful for all of the support people are showing me after the White House Correspondents’ Dinner this evening. 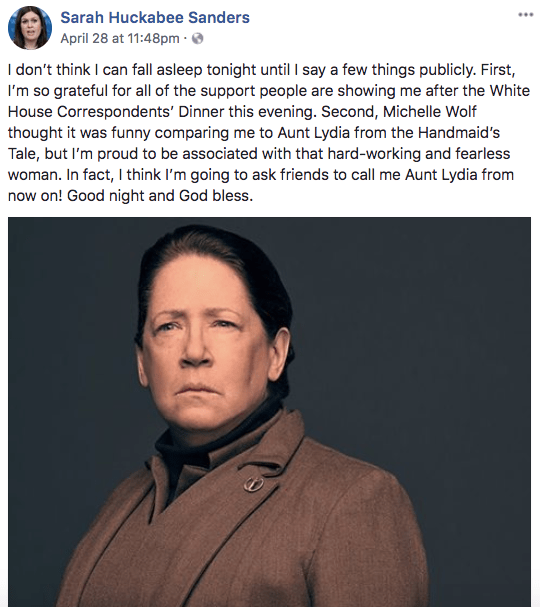 Second, Michelle Wolf thought it was funny comparing me to Aunt Lydia from the Handmaid’s Tale, but I’m proud to be associated with that hard-working and fearless woman. In fact, I think I’m going to ask friends to call me Aunt Lydia from now on! Good night and God bless. Sarah Huckabee Sanders did not write this. The account in question (DeputyPressSecretary) is a fake, like several others on Facebook which purport to belong to Huckabee Sanders. The White House Press Secretary does have a personal Facebook account, but she does not have a verified professional page. Despite this, the “Aunt Lydia” post was shared thousands of times. New York Times. 29 April 2018.